A new book explains why we humans are so screwed up, and why we take it out on our fellow animals. Physicists are always looking for a Grand Unified Theory to explain how the universe works. That would certainly be fascinating, but what we need more urgently right now is a grand unified theory of the human condition so we can figure out why our species is so screwed up. And if you’re concerned with protecting our fellow animals and the world of nature, you really need to understand what drives our own species to behave in such a destructive way. Happily, there is indeed an explanation of why we humans are bringing on a global mass extinction. 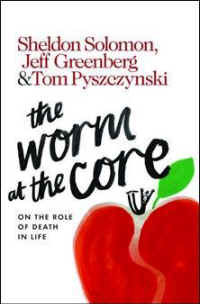 And it’s laid out in a new, easy-to-read book, The Worm at the Core – On the Role of Death in Life, by social psychologists Sheldon Solomon, Jeff Greenberg and Tom Pyszczynski. The awareness that we humans will die has a profound and pervasive effect on our thoughts, feelings, and behaviors in almost every domain of human life—whether we are conscious of it or not. … This fear contributes to human behavior far more than most of us realize. In fact, it drives us so much that any effort to address the question “What makes people act the way they do?” is profoundly inadequate if it doesn’t include the awareness of death as a central factor. And it was laid out most comprehensively by cultural anthropologist Ernest Becker in his 1974 Pulitzer Prize-winning book The Denial of Death, in which he argued that almost everything we humans do – including the civilizations we build, the belief systems we create, and the cultures in which we embed ourselves – is designed to protect ourselves from the reality of our inevitable, inescapable mortality and the terror that this knowledge causes us. We’ve written about this frequently here on this blog [‘I Am Not an Animal!’], and specifically about how our fear of death leads us to deny our own animal nature, and how this affects our relationship to our fellow animals. But over the last 25 years, the authors of this new book have conducted hundreds of studies that show conclusively that reminders of our mortality, even at an unconscious level, have a tremendous effect on our behavior toward each other and toward the other animals. We discovered that subtle, and even subliminal, reminders of death increase devotion to one’s cultural scheme of things, support for charismatic leaders, and confidence in the existence of God and belief in the efficacy of prayer. They amplify our disdain toward people who do not share our beliefs even to the point of taking solace in their demise. They drive us to compulsively smoke, drink, eat, and shop. They make us uncomfortable with our bodies and our sexuality. They impel us to drive recklessly and fry ourselves in tanning booths to bolster our self-esteem. They magnify our phobias, obsessions, and social anxieties. Very simply, we humans spend our lives telling ourselves that we’re not simply physical, mortal animals, like all our fellow creatures. We are, instead, superior, exceptional, spiritual beings and perhaps not even animals at all. People reminded of death and the similarities between humans and other animals subsequently disparage animals, even pets they don’t own. Death reminders also make people more supportive of killing animals for a variety of purposes, including population control, product testing, and medical research. For those of us in the work of animal protection, that last sentence is especially important. Terror Management Theory tells us that much of what’s being done to animals in the name of scientific research has less to do with real medicine than with demonstrating to ourselves that being able to treat our fellow animals as research subjects and commodities proves our superiority over nature and thus over death itself. Sacrifice brought death to the few to facilitate survival of the many … Rituals, then, help manage existential terror by superseding natural processes and fostering the illusion that we control them. This is something that animal protection groups really need to understand. Once you know all of the (sometimes unconscious) psychological drivers behind the practice of vivisection, along with all the other ways we commoditize animals, you understand why, despite the fact that there are more animal rights and welfare organizations than ever before, they’re not making a dent in the abuse of the animals. Quite the opposite, in fact: There’s more vivisection, more factory farming, more hunting, more everything than ever before. And if there’s the occasional small triumph, like the recent decision by the National Institutes of Health to take chimpanzees off the list of animals they experiment on, it’s just a drop in the bucket. The basic tools of animal protection groups – appealing to logic, facts, morality, ethics or people’s better nature – are no match for our deep-seated need to distance ourselves psychologically from the other animals and to treat them as inferior things that exist largely for our benefit. While our relationship to our fellow animals is what concerns us most on this blog, it’s just part of what The Worm at the Core explains about human nature. The authors discuss how denial of death affects our relationships to each other, plays a key role in many of our psychological conditions like depression and schizophrenia, and drives the political and religious divisions that lead regularly to war. Once you understand the basics of Terror Management Theory, you can follow the daily news through a whole new lens of understanding. Why are so many people drawn to Donald Trump? What’s really going on in the Middle East? Why is the United States so deeply in debt? Will we ever get a grip on climate change? The Worm at the Core has received glowing reviews but, not surprisingly, it hasn’t found its way to the top of the best-seller lists. The trouble with denial, after all, is that most people just don’t want to know about it. Burying our heads in the sand, however, won’t make the problem go away, and it certainly won’t reverse all of the destruction to the planet that’s now underway. Socrates said the unexamined life is not worth living. Jesus added that the truth will set you free. And the American psychologist William James coined the phrase, at the end of the 19th Century, that death is “the worm at the core” of the human condition. So go ahead and munch your way to the core of this fascinating book. It’s like unlocking the secret of life. And it’s essential reading for anyone trying to made a difference for our fellow animals. After all, if, like most people in the work of animal welfare, you don’t understand why we humans go on treating other animals the way we do, you’re working in the dark.